A remote Pembrokeshire island has had a new fire truck delivered by helicopter. The 4x4 vehicle was airlifted three miles (4.8km) by a RAF Chinook helicopter on to Caldey Island, reports the BBC. Caldey Island has only 40 inhabitants, including 18 monks who live at a monastery. The fire appliance will be manned by volunteers from the small fishing and farming community. 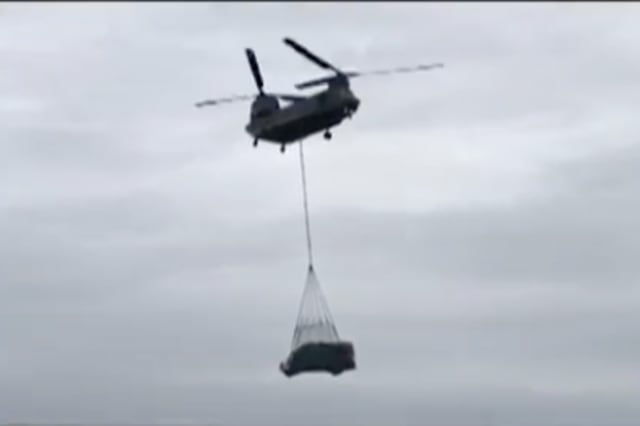 Wing Commander Phil Greville, RAF regional liaison officer in Wales, told South Wales Evening Post: "Air-lifting this type of vehicle underneath a Chinook has not been done before. "The fire service needed to get a new fire appliance out to the island and we wanted to get this type of fire-vehicle approved for air-lift by Chinook. "The rural response pump vehicle is in widespread use throughout the UK and in the future, we will be able to fly it to where it is needed when responding to major floods and other emergency situations." Located on the island of Vágar, Gásadalur is surrounded by the highest mountains on the island: Árnafjall at a height of 722 metres to the north and Eysturtindur at 715 metres high to the east. The population of the village has reduced over the years due to the strenuous route over 400-metre-high mountains to reach other villages. There are currently 18 people living in Gásadalur. Set in the hills above the Gorge de Verdon, the tiny French village of Rougon, with its population of 137, offers a great view of the gorge and is known for its resident vulture colony. The hidden village sits under a large rocky outcrop and is home to the Saint Christophe chapel, the remains of a castle and houses built in the Renaissance. The island of Tristan da Cunha, part of British Overseas Territory in the South Atlantic Ocean, has just 275 people residing on it and is an active volcano boasting rare wildlife including rockhopper penguins and the Yellow-nosed Albatross. The island is located 1,750 miles from South Africa and can only be reached by sea on a seven-day boat journey from Cape Town. It's part of the Tristan da Cunha group of islands, which includes Saint Helena Island and is the most remote inhabited archipelago in the world. A mystical desert oasis in Peru, Huacachina is located around five hours south of Lima and 10 minutes from downtown Ica. It is a small natural lake surrounded by palm trees and huge sand dunes with a population of just 115. The town attracts tourists who travel from around the world to ride the dunes. One of the world's most mysterious places, Easter Island, is also one of most remote inhabited islands with a population of just over 5,700 and its location in the south-eastern Pacific Ocean, 3,510km west of Chile. Easter Island's Polynesian name is Rapa Nui and it is famous for its 887 eerie-looking monolithic statues, moai, which were created by the early Rapanui people and scattered around the island. The island is surrounded by the world's most transparent waters and has three extinct volcanoes. The floating islands of Uros are artificial islands on Lake Titicaca in Peru. The islands are made of totora reeds tied together and feature huts, a hospital and even electricity on some of the 45 islands. The largest of the islands house around 10 families, while the smaller islands are home to two or three. Greenland's most isolated town is as far as one can get from any other inhabited area in the country, making just getting there an adventure for visitors. Ittoqqortoormiit's population is 452 and the closest neighbour is the world’s largest national park with the Danish Sirius Patrol as the only human presence in the vast landscape dominated by small game, birds, polar bears, musk oxen, reindeer and walrus. The town has one grocery shop and a couple of small convenience stores. It's the largest settlement of the Svalbard islands but Longyearbyen is one of the world's most remote towns, where the sun doesn't rise for four months and there are just 2,000 inhabitants. Longyearbyen is home to Svalbard's airport, along with a school, shopping centre, restaurants and museums. The island of Palmerston is so remote that it was not properly located on maps until 1969. The atoll is made up of the summit of an old volcano and has no airport. Electricity runs from 6am to 12pm each day and again at night. The tiny Pacific island is only visited by a supply ship twice a year and most of its 63 inhabitants are descended from one Englishman who settled on Palmerston 150 years ago. An oasis in the Havasu Canyon, Supai is a small village with spectacular waterfalls and a unique part of the Grand Canyon region. It is not accessible by road and the Havasupai Tribe administers the land. It is the most remote community in America's lower 48 states and has a population of 208. The only way to reach Supai is to take a helicopter, hike or ride a donkey along the Havasupai Trail. The village of Tahsis is located on the west coast of Vancouver Island at the head of the steep-sided Tahsis Inlet. In its heyday, the village's population was around 2,500 but following the closure of the local sawmill in 2001, the population is just 316 today. Tahsis is a summer beauty spot which attracts hikers, scuba divers and wildlife enthusiasts. Sonogno is the last village on the paved road in Valle Verzasca, located at an elevation of 918m. Visitors to the pretty village are required to leave their vehicles at the entrance to Sonogno, which has a total population of 94. It has its own language, which is a mixture of Latin and Celtic, but most of the population speak Italian. Sonogno has retained its typical architectural character of historic houses and narrow alleyways. The beautiful village of Undredal is located in Norway's 'fjord-country' along the Aurlandsfjorden. It is home to the smallest stave church in Northern Europe and has a population of 100 people and 500 goats. Before 1988, Undredal was only accessible by boat but today it can be reached by a narrow road 6.5km north of the E16 highway.